iTunes won't let me download my recent purchased Albums - only songs! Discussion in 'OS X Yosemite (10.10)' started by irock101, May 13, 2015. I am on the latest iTunes version and when I go to my previous purchases which aren't on this mac, there is no such thing as 'download all' - I have to click on each songs cloud icon to download it. How do I simply download my entire purchases without clicking each song? Well over 1000+ albums.. So I got all my albums under 'my music' now, when I right click them and select download, every song fails with error 3050. Can you please elaborate on that or how to do that? It only shows the 'most recent' albums and will only download those if I click on 'download all' at the bottom right of the screen. 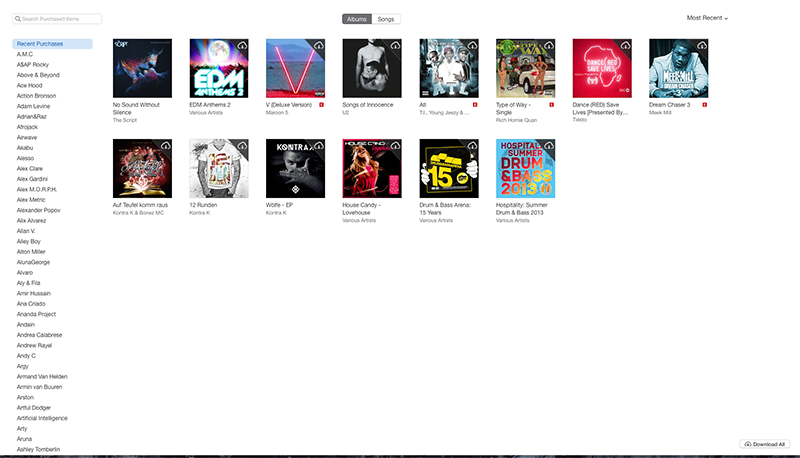 But as you can see on the left, theres a loooong list of artist / albums that I will have to download one by one. Isn't there any way to download my entire previous purchases and not just the most recent ones? If you look in the bottom right hand corner of your screenshot you have the option to download all. Thanks That worked but when I try to download the songs, Itunes tells me to check my network connection and no song downloads, error 3050. Any workaround for it? My iTunes library is on an external drive.